All three judges scored it 49-46 for Poirier, ending Holloway's five-year, 13-fight win streak. "This feels amazing. I feel like I'm in a dream right now," Poirier, 30, said. Meanwhile, Israel Adesanya continued his unbeaten run by defeating Kelvin Gastelum via unanimous decision for the interim middleweight title. 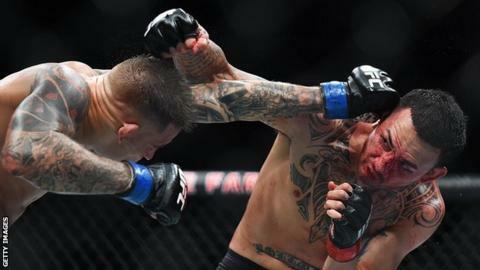 "I just beat one of the best pound-for-pound fighters in the world," Poirier added after securing the 25th - and biggest - win of his mixed martial arts career. "This is a piece of the world title. This is what I want. Now I want to unify the title." American Poirier had not entered the octagon since defeating Eddie Alvarez last July, after pulling out of a scheduled bout with Nate Diaz at UFC 230 in November because of a hip injury. He was previously considered one of the UFC's nearly men after narrowly missing out on fighting for a title. On Saturday, he produced one of the best performances of his career to out-strike the seemingly tireless Holloway, 27, over five gruelling rounds. The fight was a rematch of their first meeting in 2012 when Holloway stepped in at short notice to make his UFC debut against 'The Diamond' at UFC 143. At the time Holloway was the youngest fighter in the UFC, and that youthful exuberance wasn't enough to defeat the more seasoned Poirier, who submitted him in the first round. Holloway recovered from that loss to become the undisputed UFC featherweight champion, with his winning streak abruptly ended by Poirier, who delivered a career-best performance to capture his first UFC title after eight years with the organisation. After the fight, a bloodied Holloway raised Poirier's arm to salute his opponent's victory. "I'm not going to take anything away from Dustin. He beat a world champ and now he's a world champ. Congrats Dustin," said Holloway. After the contest, UFC world lightweight champion Khabib Nurmagomedov said he disagreed with the judges, believing the fight should have been scored a draw. But he then went on to give credit to Poirier and hint at a September unification battle with the interim champion. "I don't agree with the judges, 49-46. I got a draw," he tweeted. "My respect to both fighters, and Poirier's achievement so far cannot be denied. My congratulations Dustin, see you in September. Eagle vs Diamond." Nigeria-born New Zealander Adesanya produced a performance to remember to defeat American Gastelum and capture the interim UFC middleweight title after their thrilling battle went to the scorecards. Adesanya, 29, was dropped in the first round, but bounced back to return the favour to Gastelum in the second. And, after a contest that saw the momentum swing dramatically back and forth, the two fighters went into the final round level on the scorecards. A blistering ending from Adesanya saw him drop Gastelum on multiple occasions and claim a 10-8 final round on all three scorecards to seal the unanimous decision victory after one of the most exciting UFC title fights in recent memory. Adesanya, whose victory extended his perfect professional record to 17-0, paid tribute to his opponent, saying: "I was willing to give it all and leave it all in there. "He's a Mexican warrior, but, hey: I've got that Mexicano in me, too."